Take control of your halitosis! If you happen to suffer from bad breath (technically known as “halitosis”), then this is the article for you! 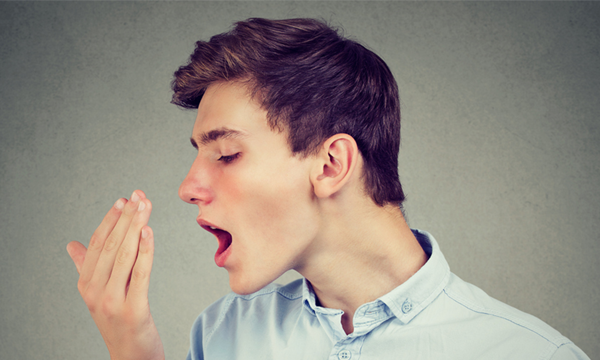 Bad breath can occur as a result of an underlying oral health problem, a bad habit, or may simply be a result of consuming certain foods or drinks, such as onions, garlic, tuna fish or coffee. An improper oral hygiene routine, such as neglecting brushing twice a day and flossing once, or not seeing the dentist and hygienist regularly puts a smile at risk for problems. Insufficient cleaning can rapidly lead to problems like gum disease and a build-up of plaque and tartar… which smell… really bad. Thankfully, a change in oral care habits will likely solve a halitosis issue… that is, if that’s the only culprit. The mouth should be moist, not dry, at all times in order to support healthy teeth and gums. Dry mouth is a condition that occurs when a person isn’t producing a healthy amount of saliva, and is commonly brought on by factors such as anxiety, using tobacco products or taking certain medications. A dry mouth environment promotes bacterial growth, gum disease, tooth decay and, of course, smelly breath. Luckily there are ways to keep the mouth moist, such as chewing sugar-free gum and sipping water regularly. Smoking or chewing tobacco, like mentioned above, can lead to a dry mouth environment which contributes to halitosis – but it’s also the chemical additives in these product that linger in the mouth and leave a repulsive smell. Using tobacco products is just one thing that should be avoided altogether for a healthy, halitosis-free smile.